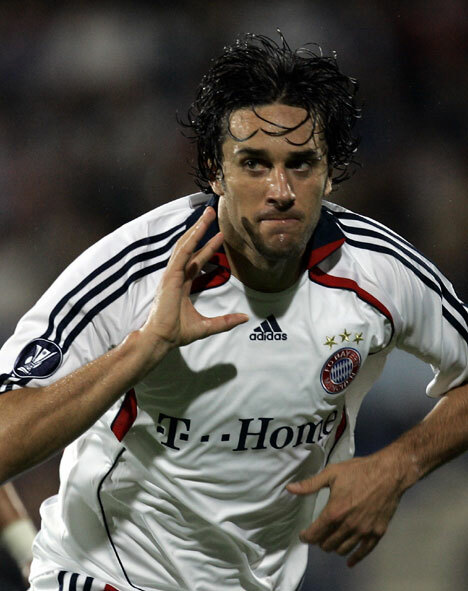 Well it has been reported in the past that Italian World Cup winner and Bayern Munich striker Luca Toni is not happy with the amount of time he has seen on the pitch this season and it seems that the forward’s displeasure with the coaching staff has finally caught up to the star player. Toni was suspended over the weekend following comments he made to the Bild newspaper regarding his feelings towards his coach, Louis van Gaal. Toni apparently said that his relationship with the coach is “as good as over” which forced the coach to remove the Italian star from his active roster coming into their UEFA Champions League match this week. And with these words will likely come at an even stiffer punishment down the road from Bayern. In fact I would be surprised if the reserve star ever plays in the German league again following the incident. Fiorentina, Genoa, and Palermo have all showed interest in the star player in the past and it seems as if Toni is forcing his way back into his beloved former league come January. And is this right? It seems as if in the modern day the worse you are as a teammate the more you get what you want. Here in the states Allen Iverson recently was released from his contract simply because he did not want to play for the lousy team he signed with. In American football wide receiver Braylon Edwards was traded following minor assault charges on a man in a nightclub. What ever happended to the phrase good things happen to good people? I guess those are days of the past now, but Toni will likely be in the timeout box until the transfer window opens back up in January.